I am lucky, I do not find it difficult to find the hat to fit the job. Hats have always been a passion of mine ever since when as a toddler I delved into our amazing dressing-up box, full of Victorian treasures, and then as a teenager when I spent lovely afternoons in the hat department of Garland’s of Norwich trying on the biggest and the best hats with my Mum. I am still the only person at a German summer fete who wears a hat and each year. I look longingly at my father's Panama, regretting that we didn't buy the one, complete with its travelling tube, that we admired at the car-boot sale last year. I am actually very happy to have so many different hats that I can choose from, especially these days when job-security is high on the agenda of most of my everyday conversations. It could in fact be that at the moment being self-employed is more secure than having a “proper job”. It is certainly more flexible and the ability to make a quick change of hats is giving me a better chance of staying put and not having to spend yet another year travelling all over the place in search of work. The charity that I often work with here in Germany provides a wide range services for children and adults with disabilities. As I get to know the different departments better I am discovering that I can step in to most areas and just pop on the hat that I need. Of course it is in the Conductive Education department that I wear my favourite hat and where I have my regular clients and groups, but in the past month I have had a stint in the physiotherapy department, the residential home, the special-care unit, the flat-finding department and the integrated kindergarten. As an added bonus this month I have aquired another new hat, by setting up a new, very small art-therapy department. I have had so many different hats on recently that I haven't known whether I was coming or going. Hence the lack of blogging! Looking back, the best hat of all was the the bits-in-between hat, the Susie-the-artist hat. Just occasionally I wish that I could be wearing wear this all the time. When I have my artist’s hat on my knees and back don’t ache so much! I was, however, more than delighted to be back in the conductor's hat when I helped out in the kindergarten at lunch time each day this week. I have had a very special thirty minutes every day to sit and commune over lunch with a delightful six-year-old. She tells me with just the pressure from a hand, with a blink of an eye or a smack of her lips, exactly what she would like to aim for next on the fork! It made eating a very different experience for me and has been the highlight of my week. When I told this little girl how much I loved to be there with her I received the most wonderful smile to take home with me. I believe that it was as nice for her to know how much I enjoyed our time together as it was for me to be there. With the coming of spring I have had Susie-the-cyclist's hat on for a couple of months now, but it was only this week that it has been time to get the summer cycling gear out, even though with early morning temperatures ranging between twenty-seven and just eight degrees celcius. it has been a bit chilly around the knees some days. 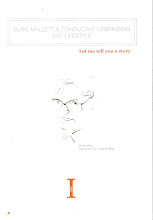 Although cycling the ten kilometres each way between my flat and work tires me, it does give me a valuable thirty-five minutes with my dreams, with the cuckoos and the clover, and it also keeps me fit. I have had an interest in gargoyles and green men since I was a teenager. 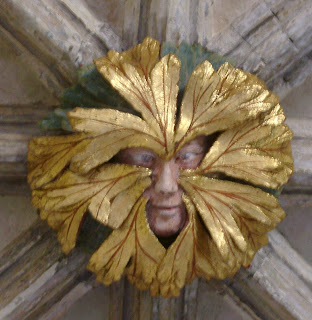 There are many in and on the churches of Norfolk where my passion for them started. 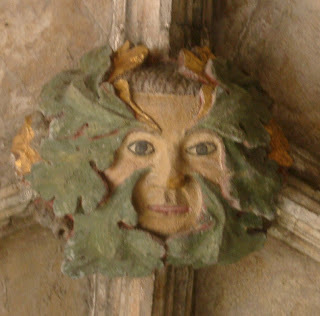 The Norwich Cathedral Cloisters have about ten green men embossed in the ceiling. I walk there each time that I visit home and know every leaf peeping out of every ear, and every bulging eye. Over the years I have discovered and photographed them in many other cities, including Paris. Notre Dame has some lovely green men, as do the streets of Bamburg in Germany. 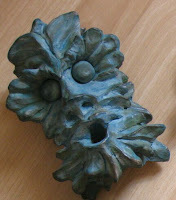 Nürnberg's numerous churches have some wonderful "Wasserspeier", gargoyles with gaping mouths which drain off the water from the roof, many of which have acted as an inspiration for my own creations. 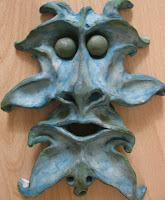 I have painted funny faces and have designed my own oddities and I have also attempted on several occasions to make masks, gargoyles and green men from both paper-mache and from clay. 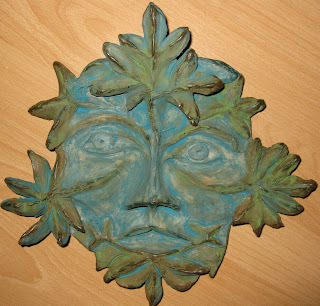 About fifteen years ago I made a lovely pixie-like head that still hangs beside the front door of a flat that I once lived in. It has a gapping mouth where the loud-speaker and the device for opening the door is hidden. 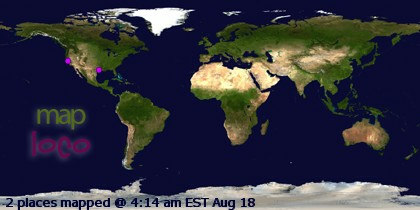 It is still able to give even regular visitors quite a shock. 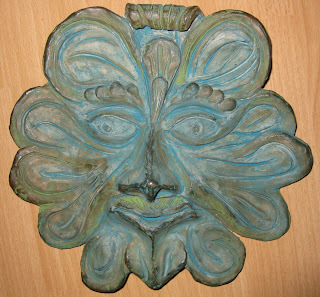 Wearing my artist’s hat, over the past two weeks I have had another go at "green man" production. I believe that this is my most successful attempt to date and I love the technique that I have just discovered of using oxides to colour the biscuit-fired clay. The few people who have seen the finished creations say that they already look like antiques, that they could be a thousand years old! These “fans” also ask why I don’t sell them, as they believe they would go like hot cakes. Sorry they are not for sale! They are going to decorate my balcony or be given as presents to friends. Who knows, maybe the next batch will go on the open market. It all depends on how the credit crunch develops.